Anniversary gemstones are prefect present for wedding anniversaries - one of the happiest dates in the life of people loving each other. This day is very special – that’s why very different than any other celebration. And it is important to surprise your loved one with something desired. Gems were always considered expensive and elegant present. Therefore jewelry gift to loved ones is deemed as a sign of respect and admiration. In addition the gemstone corresponding to the wedding anniversary is useful and stylish gift from loving or to the loved one. And the choice is big – a ring or bracelet, necklace or earrings, or single gemstone – it is always easy to choose and not to be afraid if this is the best present. But remember - love is the most im﻿portant! If you think about gemstone present you can check the Anniversary Stone Gift list - endorsed by the Jewelers of America, the American Gem Trade Association, the Gemological Institute of America (GIA) and the American Gem Society and the most popular contemporary reference. 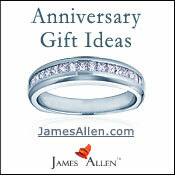 It describes which gemstone to which anniversary is assigned.